Zimbabwe To Street Vendors: Pack Up, Clean Up, Ship Out! 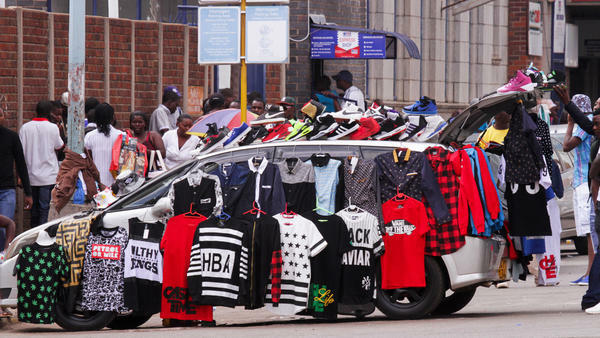 Street hawkers have taken over so many sidewalks in Harare's city center that some vendors are turning their cars into makeshift shops. He'll sell you the shoes off his hood. "Where can I go now?" asks Temptation Tekera. 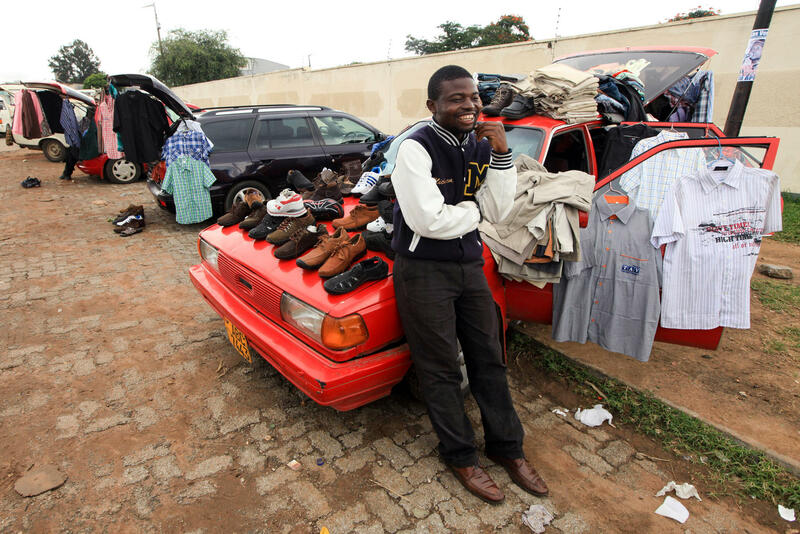 He is one of an estimated 20,000 street vendors in Harare, the capital city of Zimbabwe. The vendors sell everything from sweet potatoes to new and used footwear to pirated CDs. Goods splay across the sidewalks, making it a minefield for pedestrians in a hurry. Now the government wants the vendors to pack up their wares and register and pay rent for one of 6,000 places in designated zones. The deadline is June 26. The goal is to restore order to the once sedate city. "We cannot afford to have a nation of vendors," says Minister Sithembiso Nyoni. "So no site unless it is designated by local authorities." The traders aren't happy about that. They say they're not selling on the street by choice, but because they must make ends meet in a tough economic environment. "That's where we get food, that's where we get rent. That's where to get everything," says Tekera, who sells an assortment of plastic toys. "I don't have any direction to go. Give us jobs and we will work." There are no jobs in Zimbabwe, says Tobias Tsava, another trader. He fears that if he's evicted from the streets, his livelihood will be at risk. "We are all worried," Tsava says. "Most of us are qualified. We have got degrees, diplomas, we are drivers, mechanics, but no jobs. Industry has collapsed." Indeed, joblessness is a perennial problem in many parts of Zimbabwe, once the prosperous food basket of southern Africa. After the hyperinflation of 2007-2008 and the subsequent economic collapse under President Robert Mugabe, the economy remains shaky. Hundreds of street traders, wearing yellow reflective jackets, gathered for a noisy meeting recently in a church hall in Harare. "We have attended this meeting in solidarity with the vendors," says Charity Mandishona, who's with the Zimbabwe Chamber of Informal Economy Associations. "The government should not chase them out of the streets. They should first of all find an alternative — then they can take them off the streets. The government promised, during the last elections, that they are going to create 2 million jobs. Up to now, there are no jobs." "Even if [people] want to rent shops, rents are too high, they can't afford, so better they sell in the streets," says Gaudentia Makahamadze, a widow who sells knitting wool. "I don't think there's anything bad about selling in the streets. I have got two children to look after. I'm paying school fees. I'm getting the money from the street. They must have mercy for us." Initially, Zimbabwe's government warned vendors they would be moved by force. Then the defense minister announced he would not deploy soldiers on the streets. Nonetheless, Minister Sithembiso Nyoni says those who do not have the required papers to sell in designated vending areas will be stopped. "So, after the cutoff date, anyone who has no card, no number, no site to go to, will not be allowed to trade anywhere," says Nyoni. She adds that the vendors must themselves clean up the city before they ship out. Charity Makinga, a customer, sympathizes with the street traders: "Life is too tough in Zimbabwe. Life is too tough." Now to Zimbabwe where law enforcement has cracked down on thousands of street vendors. The government says in the capital of Harare, vendors spill into the streets and make the downtown chaotic. They're being told to pack up their wares and move into designated zones before the end of the month. The traders say they're not selling on the street by choice but because they must make ends meet. NPR's Ofeibea Quist-Arcton reports. OFEIBEA QUIST-ARCTON, BYLINE: The issue of Zimbabwe's street traders is not a debate being conducted on Twitter or Facebook, at least not by the protagonists on the streets of once sedate and orderly Harare. But the twists and turns of the saga of sidewalk vendors is the talk of the town. Estimates put the number of street vendors as high as 20,000 just in the capital. Traders say that's because there are no jobs in Zimbabwe, and, facing eviction from the streets, their jobs are now at risk. TOBIAS TSAVA: My name is Tobias, Tobias Tsava. But I don't think they can move us since we don't have jobs and nowhere to go. Most of are qualified. Some have got degrees and diplomas. We are drivers, mechanics, but the industry's collapsed. QUIST-ARCTON: Vendors sell everything you can imagine from sweet potatoes to new and used footwear and pirated CDs, with goods splayed across the sidewalks. It's a minefield for pedestrians in a hurry. Temptation Tekera sells an assortment of plastic toys and asks, what's the alternative to street trading? TEMPTATION TEKERA: We are going to fight for our families - simple. That's where we get food. That's where we get rent. That's where we get everything. Where can I go now? QUIST-ARCTON: The chaos must stop, warns Sithembiso Nyoni, minister of Small and Medium-sized Enterprises. Twenty-six June is the deadline set for street vendors to remove their makeshift pitches from the downtown central business district and register for one of the limited 6,000 places in relocation sites around Harare. And they'll have to pay rent, says the minister when she was addressing representatives of the vendors recently. SITHEMBISO NYONI: We've been working to provide a lasting solution, which is what I'm announcing today. So please make sure your members comply with this, OK? UNIDENTIFIED PROTESTORS: (Foreign language spoken). QUIST-ARCTON: Hundreds of street vendors wearing yellow reflective jackets gathered for a noisy meeting recently in a church hall in Harare. Charity Mandishona from the Zimbabwe Chamber of Informal Economy Associations says these people need a living wage. CHARITY MANDISHONA: The alternative is for the government to create employment as they had promised on the last elections that they are going to create 2 million jobs. And up to now, there are no jobs. There's no shortcut to that. QUIST-ARCTON: After the hyperinflation of 2007-2008 and the economic collapse under President President Robert Mugabe in what was once the prosperous food basket of southern Africa, the economy remains shaky. Street trader Gaudentia Makahamadze, a widow and mother of two, sells knitting wool. GAUDENTIA MAKAHAMADZE: My husband passed away. I've got two children to look after, and I'm paying school fees for them. They must have mercy for us. QUIST-ARCTON: Initially, Zimbabwe's government played hardball, warning vendors they would be moved by force. The defense minister stepped in and said he would not deploy soldiers onto the streets to intervene in the dispute. But Minister Sithembiso Nyoni says those who do not have the required papers to sell in designated vending areas before the end of this month will be stopped from selling. Ofeibea Quist-Arcton, NPR News, Harare. Transcript provided by NPR, Copyright NPR.